The Atchison, Topeka & Santa Fe bought a total of 65 4-8-4s, in four batches, all from the Baldwin Locomotive Works. The first group of 14 were delivered in 1927 (road number 3751), 1928 (road numbers 3752 through 3760) and 1929 (road numbers 3761 through 3764). 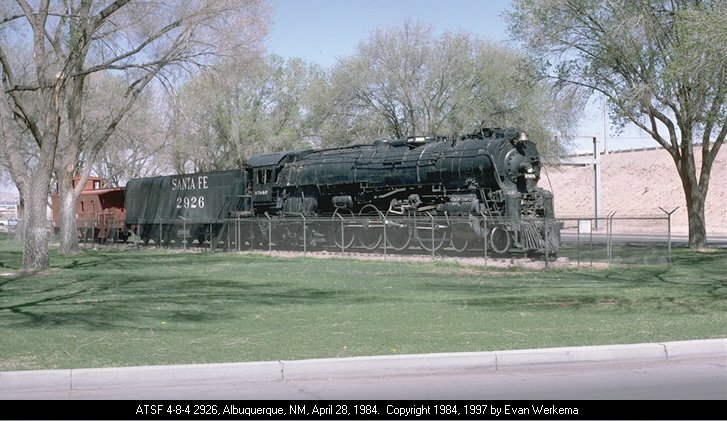 Curiosly, 3751 was listed in Santa Fe's diagram book as a "Heavy Mountain". Perhaps this was becaused the road number "3751" followed its last 4-8-2 road number "3750". These locomotives burned coal and had 73" drivers. They were later rebuilt by the AT&SF to have 80" drivers and were converted to oil burners. The first was rebuilt in 1938 and the last in 1941. This group was known as Class 3751. The last group of 30 were built in 1943 and 1944. Wartime shortages of material resulted in ordinary metals being used for their construction. As a result, they were the heaviest Northerns ever built. They out-weighed their nearest rivals by over 2000 pounds. This group was known as Class 2900 and included road numbers 2900 through 2929. There are nine surviving AT&SF Northerns including one (the very first, number 3751) which is operational and owned by the SBRHS. The other eight are: 3759 in Kingman, AZ; 3768 in Wichita, KS; 2903 in Union, Il; 2912 in Pueblo, CO; 2913 in Madison, IA; 2921 in Modesto, CA; 2925 in Sacramento, CA and 2926 in Albuquerque, NM. Data from 1947 Locomotive Cyclopedia tables and ATS Locomotive Diagrams Assorted supplied in August 2013 by Allen Stanley from his extensive Rail Data Exchange collection . Works numbers were 69788-69799, 69801 in 1943; 69800, 69802-69817 in 1944. Thermic syphons (30.5 sq ft) in the 84-in combustion chamber only. Firebox heating surface includes 124 sq ft in the combustion chamber as well. Steam admission through 15" (381 mm) piston valves. Their appliances included an American multiple throttle, Worthington Type 6-SA feed water heater, Timken roller bearings on all axles. These 30 engines were built to the #3765 design (Locobase 236), but because of wartime restrictions some of the parts were heavier to offset the lack of high-tensile alloys. As a result of the substitutions, these locomotives became the heaviest passenger locomotives ever built. Wartime exigencies required that they haul freight until the war ended; then they were assigned to the Scout and the Grand Canyon Limited. AT&SF drawings show slightly different EHS (5319 sq ft), weight on drivers (295,000 lb) and total engine weight (510,000 lb). Data from 1930 Locomotive Cyclopedia tables and DeGolyer, Vol 77, pp. 74-106. Works numbers were 60004 in May 1927. 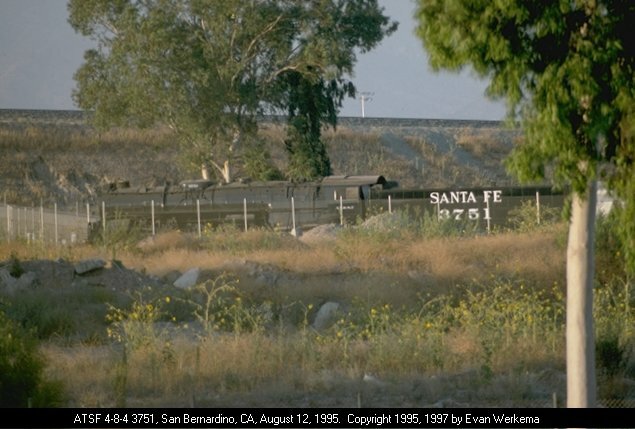 According to the San Bernadino Railway Historical Society's web site (www.sbrhs.org/history.html consulted in April 2002), the Santa Fe's first Northern combined the conservative boiler pressure of 210 psi (14.5 bar_) with many state-of-the-art features. Among the latter were the cylinders cast integrally with the bed, Duplex stoker. Up front was the front-end American throttle, Type E superheater. Valve travel for the 15" (381 mm) diameter piston valves amounted to 9" (229 mm) through a multiplying lever in the Walschaerts valve gear, which was operated by the Ragonnet power reverse gear. Also note the superpower tube & flue distribution. The firebox had a combustion chamber contributing 89 sq ft (8.3 sq m) to direct heating surface area as well as 57.5 sq ft (5.35 sq m) in six arch tubes. Of the 221 3 1/2" flues, 204 held superheater elements. Elesco supplied the feed water heater. This was the only Santa Fe Northern completed without thermic syphons. Ran between Kansas City and Los Angeles pulling passenger trains of up to 26 cars on the level and 15 up a 2% grade. As a freight hog, the 3751s rolled 105 loaded cars of 5,949 tons at 45 mph (72 kmh) on level track. Maximum drawbar horsepower measured at 40 mph was 3,220 hp. Top speed rating from introduction was 70 mph (113 kmh). And the distances covered! From Los Angeles eastbound, the engine might travel to La Junta, Col (1,235 mi), Wellington, Kan (1,535 mi), or Kansas City, Kan (1,789 mi). 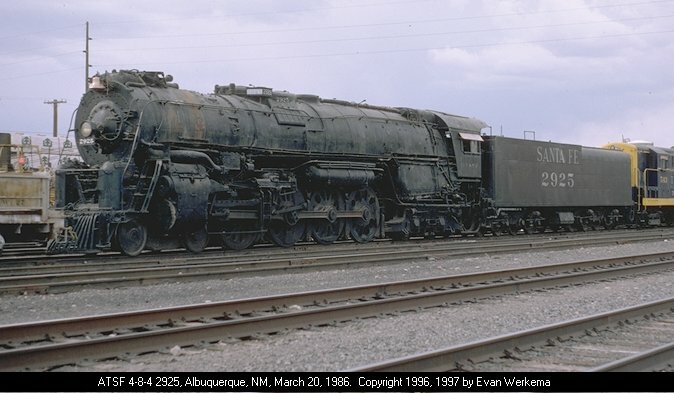 Still, according to Lloyd E. Stagner's excellent summary of the Santa Fe 4-8-4s in Trains Magazine (found on the web at http://www.wheelsmuseum.org/stagner.html), the 30" cylinders produced high back pressures that "proved troublesome, resulting in a loss of power at higher speeds ...a retired Santa Fe master mechanic who knew the 3751 class well ... remarked that as built, 'they smelled of lemon', due to the inability of the 15" piston valves to get rid of the exhausted steam efficiently." Built in 1927, converted to oil burners in 1937-38. A more significant rebuild (Locobase 14963) saw engines get new frames, lengthened smokebox, new rods, 80-in (2,032 mm) Boxpok drivers and Timken roller bearings on all axles in 1939-1940. After the rebuild, which also included redesigned steam passages and steam pressure raised to 230 psi (15.85 bar) , the engines were rated at 90 mph and often ran at 100 mph or more. The class retired in 1956-1957. Data from Santa Fe diagram book digitized and made available at "Atchison, Topeka and Santa Fe steam engine diagrams and blueprints," Kansas Memory, a website of the Kansas Historical Society, diagram at  . (Thanks to Chris Hohl for a 22 February 2013 inquiry that led to adding this upgrade to the stock of entries describing Santa Fe 4-8-4s.) Rebuilds were undertaken in 1938 with further modifications from 1941-1948. 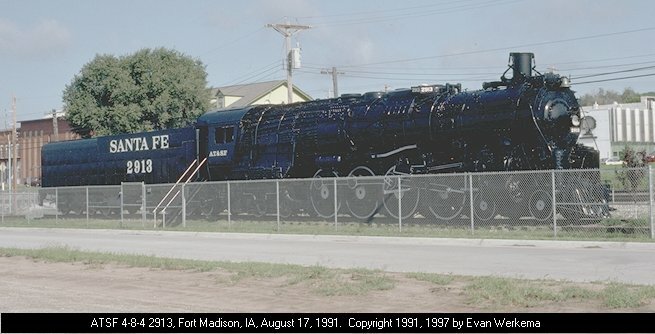 Most of the early 4-8-4s shown in Locobases 233 (3751), 443 (3752-3760), and 235 (3761-3764) were rebuilt according to the specifications shown in the data section of this entry. In almost all respects, they matched the new engines (3765 and later) that entered service in that year. The diagram, last updated on 11 April 1950, offers a long list of state-of-the-art late steam locomotive components, materials, and structures that met the ever-increasing demands for speed and pulling power. There was the integrally cast locomotive bed. All axles turned on Timken roller bearings. Side rods were arranged in tandem. Engine truck was the Batz design while the trailing bogie was supplied by Delta. In addition to the 20-psi (1.38-bar) increase in boiler pressure, which partially offset the 7" (178 mm) enhancement in driver diameter, the newer boilers had more thermic syphon area (125 sq ft/11.6 sq m), a Worthington feedwater heater, and American multiple throttle. NB: Of the 231 flues in the boiler, 11 did not hold superheater elements. The upgrade meant more weight. The nearly seven additional tons (6.4 metric tons) of adhesive weight certainly helped maintain an adequate factor of adhesion. Total engine weight increased almost 23 tons (20.9 metric tons). At that, the rebuilt 3751s still weighed a minimum of eight tons (7.3 metric tons) less than those delivered in the late 1930s. 3752 was rebuilt twice, once in 1938 (see above). A 1948 update included Franklin rotary cam poppet valve gear and 115 sq ft (10.7 sq m) of security circulators instead of the syphons. Evan Werkema, in a 12 July 2011 post to a TrainOrders thread at  (last accessed 12 June 2016), said that the late valve change was "...reportedly a successful installation, and the engine performed well, with improved horsepower and fuel economy compared to her sisters. It evidently wasn't enough to warrant further applications or stem the diesel tide, however. I recall reading somewhere that a problem in the valve gear was what took her out of service for the last time in mid-August 1953." Data from DeGolyer Vol 77, pp.108-151. Works numbers were 60328-60334 in January 1928, 60385-60386 in February. 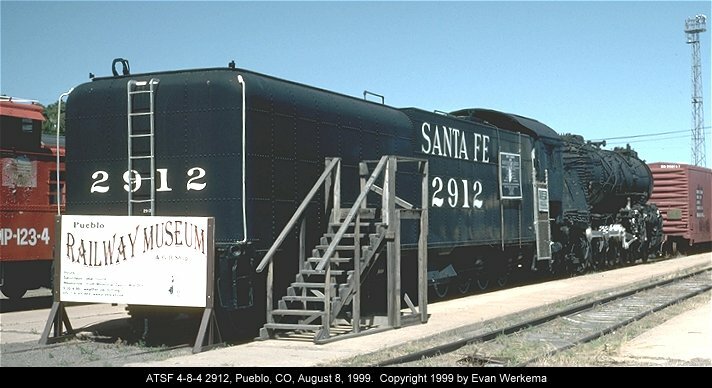 According to Lloyd E. Stagner's excellent summary of the Santa Fe 4-8-4s in Trains Magazine (found on the web at http://www.wheelsmuseum.org/stagner.html), 3755 & 56 had Dupont stokers and butterfly doors, while 3757-3760 had Duplex stokers and vertical doors. For the major rebuild applied to these locomotives in the late 1930s, see Locobase 14963. Data from DeGolyer, Volume 82,pp. 396+. (Thanks to Anthony Platt for his 8 June 2016 email commenting on 3764's valve gear and noting that it was in fact soon modified with Walschaert gear.) Works numbers were 60764-60766 in April 1929 and 61091 in September. This quartet continued the series that began with the 3751 and 3752 (Locobases 233 and 443). The only significant difference between these engines and the 1928 3752s was a slightly larger thermic syphon area. The firebox had two thermic syphons and combustion chamber had one; these contributed 125 sq ft (11.6 sq m) to the heating surface area while the combustion chamber itself added 89 sq ft (8.3 sq m) and the arch tubes 20 sq ft (1.85 sq m). The boiler also was fitted with an Elesco feedwater heater. 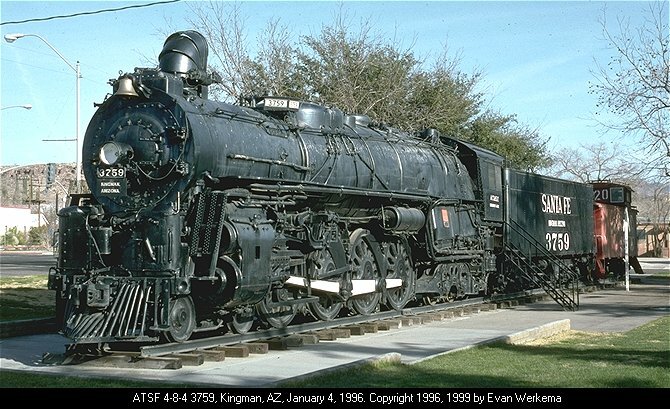 Lloyd E. Stagner's excellent summary of the Santa Fe 4-8-4s in Trains Magazine (found on the web at http://www.wheelsmuseum.org/stagner.html) says that 3764's delivery was delayed in order to fit Caprotti valve gear. Anthony Platt noted that, although it's often described as a poppet-valve gear, the installation used piston valves. See Wes Camp's very detailed description of the Caprotti layout in the Train Orders thread at http://www.trainorders.com/discussion/read.php?10,2512961 (last access 12 June 2016). Tests were inconclusive, but in any case, the assembly "simply was too light for the heavy service required on big locomotives ...and it had the further disadvantage of requiring specialized maintenances." Evan Werkma, in his 12 July 2011 post, commented that "The locomotive didn't develop the same horsepower as her Walschaerts-equipped sisters, and that the gear was too lightly constructed to stand up to the service demanded of it." Data from 1947 Locomotive Cyclopedia tables. (Thanks to Chris Hohl for his 16 June 2013 email querying the tender capacities.) Works numbers ran 62119-62129 in 1938. With Engine #3765, the Santa Fe Northern design underwent several changes. The design featured revised cylinder dimensions, substantially higher boiler pressure, and a modified cut-off (limited to 60% of stroke) to supply the same tractive effort with larger drivers. As Lloyd E. Stagner points out in his history of the Santa Fe 4-8-4s in Trains Magazine (found on the web at http://www.wheelsmuseum.org/stagner.html), the change in cylinders was intended to eliminate the back-pressure problem posed by the 30" pistons in use up to that point. The firebox now had three thermic syphons-two in the firebox, one in the combustion chamber-that contributed 125 sq ft (11.6 sq m), Timken roller bearings on all engine axles, Worthington Type 6 SA feed water heater, and all manner of up-to-date equipment. Also beginning at #3765, fuel was changed from soft coal to oil. 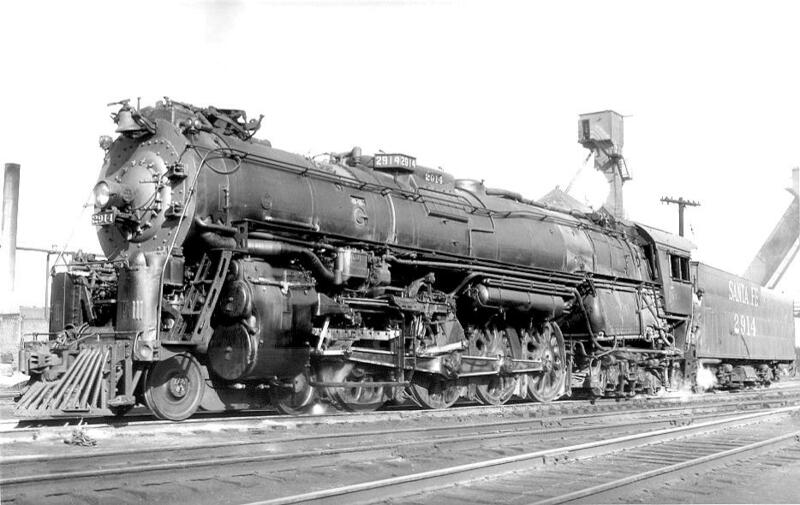 Engines 3776-3785 were ordered in 1941; see Locobase 234. 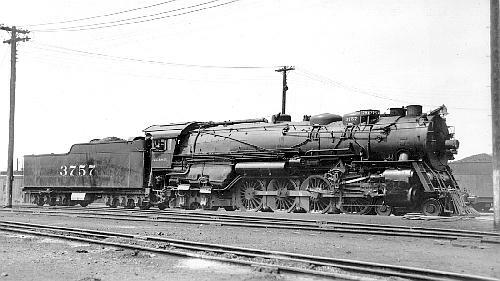 Together with the Union Pacific FEF series and the New York Central's Niagaras, these engines were the highest expression of ultra-long-distance passenger power in US service. Nickel-steel boilers replaced in 1949-1952, engines retired in 1959. Data from table and diagrams in 1947 Locomotive Cyclopedia and "Atchison, Topeka and Santa Fe steam engine diagrams and blueprints," Kansas Memory, a website of the Kansas Historical Society, diagram at  . Works numbers were 62465-62474 in 1941. Based on the 3765s (Locobase 236), but with further enhancements. Firebox heating surface was sharply reduced from the 3765s and included only 29 sq ft (2.7 sq m) of thermic syphons in the combustion chamber only. Ten delivered in 1941, nickel-steel boilers replaced in 1949-1952, class retired in 1956-1959. Being cosmetically restored. Contact Steve Rippeteau for more information.